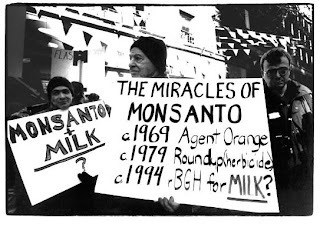 Curious about Monsanto's contributions to society over the past century? Oliver Lee from Takepart compiled a list of the agri-giant's five "most dubious contributions to the planet," a list both disturbing and enlightening. Here is an abbreviated version, but be sure to check out the whole story here. 1. Saccharin. 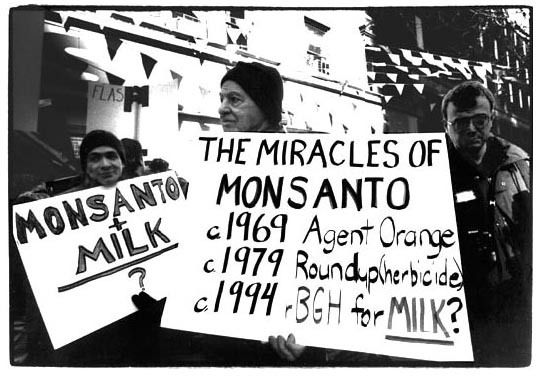 Monsanto's earliest foray into messing around with the food system started way back in 1901. 70 years later, the FDA found it caused cancer in test animals. 30 years after that, in 2001, Monsanto was able to reverse the FDA's decision to require the sugar replacement to have a warning label. 2. Polystyrene. Long after we're gone, Monsanto's legacy will still be haunting the planet in the form of tiny pieces of non-biodegradable, toxic styrofoam. 3. Agent Orange. The death and destruction from this Monsanto product just manifested more quickly than the rest, with 400,000 deaths and disfigurements and 500,000 babies born with birth defects. And that's just the human toll. 4. Bovine Growth Hormone. Banned in many other countries, rBST milk is found to have lower nutritional content and cancer causing properties. At least the U.S. now allows separate labeling for rBST-free milk. 5. Genetically Modified Seeds. Monsanto finally got to the heart of the food supply system by locking farmers in developing countries into seed serfdom. Interestingly, and much to Monsanto's chagrin we hope, farmers are continuing to resist the company's attempts at tyranny. Now, with the extent of technology and brainpower that went into these inventions, could you imagine the world if all of these were for the good of the planet and its people? Wow. I had no idea monsanto had their hands in all this. It is like every environmentally devastating item from the last century plus is tied to them. Your ending question says it all.